The only French Charles de Gaulle aircraft carrier is currently not available due to mid-life upgrade. French Navy Rafale M fighter jets will train on a U.S. Navy aircraft carrier between April and May 2018. According to navyrecognition.com, the announcement came when the U.S Navy Chief of Naval Operations (CNO) Adm. John Richardson met his French counterpart, Chief of Staff of the French Navy (CEMM) Adm. Christophe Prazuck on December 6 in Paris. Marine Nationale sailors will train in the United States due to the temporary unavailability of the only French aircraft carrier. French Rafale-Ms and E-2C Hawkeyes will fly to NAS Oceana in Virginia for a first stage of training. Then some of the aircraft, aircrews, and support personnel will fly out to the USS George H.W. Bush to operate together with the carrier's air wing. The Charles de Gaulle (R91) aircraft carrier has entered drydock in last February for a mid-life upgrade and she will be under maintenance and modernization till summer 2018. The refit was necessary after 15 years of intense service and to allow the ship to operate for at least another 20 years. Rafale M is already qualified to operate on American Nimitz-class Carriers. In 2008, when the CDG made its first major refit, three Rafales fighters trained on the USS Harry S. Truman (CVN 75). During the exercise, French pilots accumulated six traps with two Rafales and one E-2C making two traps each. 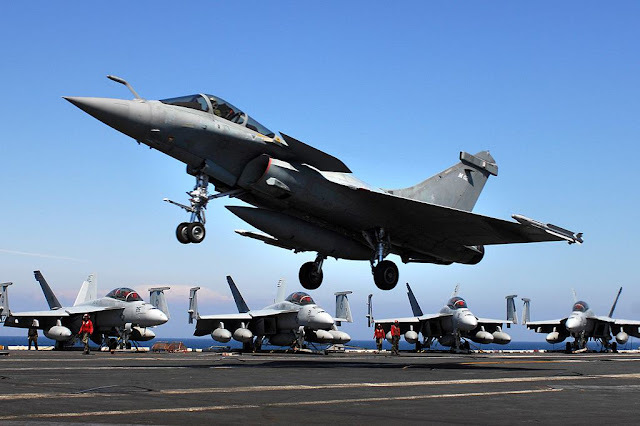 A third Rafale made 13 touch-and-go landings to test how well French planes could handle the stresses of landing on Truman's flight deck. French air group also conducted flight operations during a joint task force exercise with USS Theodore Roosevelt (CVN 71) and Carrier Strike Group 8 in the same year.